New ball in World Cup in Brazil is radically different from its predecessors in that the surface of the leather lacing disappeared forever. Now you can inflate the balls with a pump and needle valve through a virtually invisible. inflating procedure also takes much less time than before. 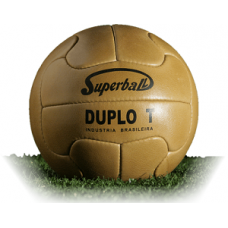 Patented such balls Argentinean company "Tossolini -Valbonesi-Polo & Cia" back in the 1930s, and initially the balls used in the Argentine championship. But in 1950 the balls finally waited in the wings, and the official shell called the "Superball Duplo T". As with other precursors, the ball was leather, made by hand, and consisted of 12 panels, but they are more curved. In Brazil the FIFA world championship for the first time allowed to print the company logo and text on the ball - as an exception. In the next four championships such liberty is not allowed.